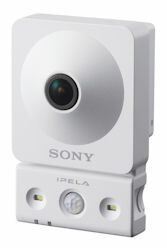 PARK RIDGE, N.J. – Aug. 26, 2013 – Sony Electronics announced today a new line of affordably priced, high-performance security cameras. The high-definition C-Series cameras – models SNC-CX600 and SNC-CX600W – fit a range of security or surveillance applications, especially those for the small-to-midsize business (SMB) market. This includes retailers, offices and restaurants. The SNC-CX600 and SNC-CX600W both have a list price of $497. Sony plans to make the SNC-CX600W available through its product distribution channel in early September, while the SNC-CX600 is planned for December availability.